What a race! Leading Light is the Gold Cup champion for 2014 at Royal Ascot. Massive run from Missunited. 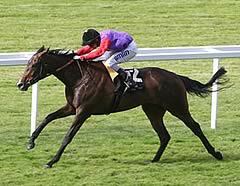 Leading Light edges thrilling Gold Cup to become only the 3rd St Leger winner to follow up in 100 yrs. A stunning renewal of the Gold Cup will be remembered for a brilliant ride by Joseph O'Brien on the winner, Leading Light. Niggling his mount before the home turn, O'Brien responded as The Queen's runner Estimate, ridden by Ryan Moore, manoeuvred into position as the bend unfolded. Estimate came alongside on Leading Light's inner, going slightly better and apparently bound to take a vital advantage, but O'Brien galvanised his willing partner and kept Estimate from pulling around the weakening Brown Panther. Moore was forced to switch inside and squeeze through a gap between that Brown Panther and leader Missunited, while Leading Light enjoyed a clear run on the outside. He wandered left before straightening in the final furlong, but did enough to prevail by a neck and a short-head from Estimate and Missunited. The winning jockey said modestly: "When you win, it's a good ride. They say that there is no such thing as a bad winning ride. When you have a tough horse on your side it's easier. "Ryan was looking for a bit of room, as he was well entitled to, and I was well entitled to keep the room I had. When I got to the front, my horse had a little look and he just wandered a little bit left, probably because he was getting tired. I was rowing away on him but I had some left and I was trying to hold off using my whip for as long as I could. Ryan gave me a little help when he was on my inside by pushing me along a bit. "My fellow is as tough as nails, but I think his optimum trip is probably a mile and three-quarters to two miles. At that trip he would have a bit more zip at the end, but he's as tough as old boots and keeps pulling it out. I was always holding on. "It's a brilliant feeling to win this race - unbelievable. Ryan is probably the best jockey in the world, and I've finished behind him on many occasions." Sep 25 The Queen's Estimate was disqualified from her second place following a British Horseracing Authority disciplinary panel hearing in London on September 25. A post-race sample containing morphine had been produced by Estimate, although trainer Sir Michael Stoute did not face a penalty as the source of the positive test had been found to be contaminated feed, with the BHA satisfied all reasonable precautions had been taken to avoid any breach of the rules. Despite that, the Rules of Racing state that horses producing a positive sample for a prohibited substance should be disqualified from relevant races. Stoute's Russian Realm was ninth in the Buckingham Palace Stakes at the Royal fixture and was another to be disqualified. The BHA tweeted: "The horses have been disqualified from the races in question. No financial penalty has been imposed upon the trainer."